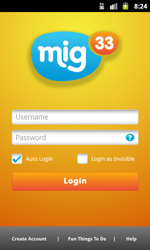 Mig33 is a community of millions of users chat to meet friends and have fun every day. Chat via IM and Chat Rooms, send gifts, play games or just use it to make cheap overseas calls and text. Mig33 helps you to connect with millions of people, right at your fingertips. # A whole new sleek interface allows for FAST and EASY access to all features. # New photo application allows you to snap your memories & add fun frames and effects to them before sharing them with your friends. # Multi-tasking is here, New Window Manager allows you to switch between multiple conversations, chatrooms or pages easily. # Hours of fun with better battery life. Overall, this version is quite slick. I'm using an HTC Desire S.